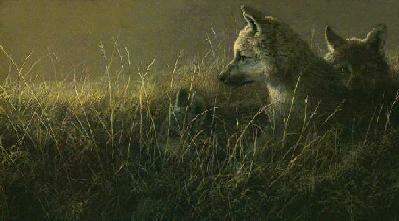 "Where All The Best Art Hangs Out"
In this poignant portrait of three young wolf pups, John Seerey- Lester paints the eternal plight of the wolf - destroyed through the centuries for the crime of being a predator. These wolf pups have been abandoned, not by their mother, but by humans and their questionable wildlife management practices. ABANDONED by John Seerey-Lester - $175.00 13-1/2" x 32-1/2"
(ASM-49) Published from an acrylic painting.